When users search for websites and other information on the Internet, they may not always obtain the desired results. In many cases, users must carefully formulate their queries in order to obtain the information they are seeking. (...) Website authors, on the other hand, often have such expertise and are able to formulate queries that will provide information likely to be of use to visitors of those websites. Specialized search functionality often appears on websites, allowing visitors to those websites to see search results tailored to the particular content they are likely to be interested in, based on the fact that they are searching from that website. For example, a website devoted to traffic information can interpret a query such as "Interstate 280" differently than a general-purpose search site would provide. The fact that a user is visiting the traffic information website means that he or she is interested in traffic information. However, it is not always convenient for users to visit a particular website in order to perform such a specialized search. Users may wish to perform all (or most) of their searches on a general-purpose search site, such as www.google.com, without having to visit different websites to perform different searches. Accordingly, it would be useful if third-party content providers could enable specialized searches on general-purpose search sites. Subscribed links are basically custom OneBoxes you choose to have on your search results pages. They're triggered when your query matches a pattern, for example a distance measuring subscribed link could be triggered when you search for "distance from London to Moscow". This service is now ready for prime time, has been rebranded as Google Search Add-Ons and can be found at the bottom of Google's preferences page. Google recommends you a list of popular search add-ons, but you can add others from a directory or develop your own. 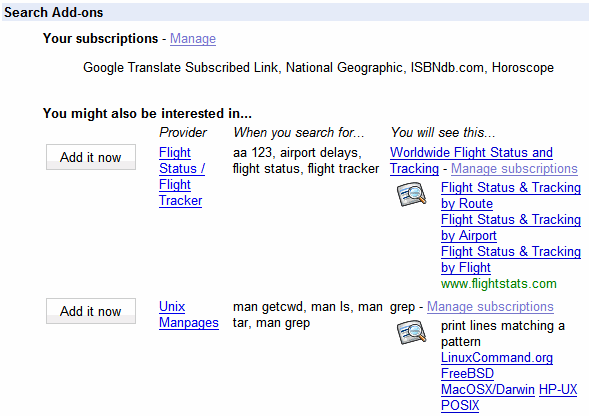 For example, I was recommended a Unix manpages add-on that shows-up if you type "man" followed by a Unix command. 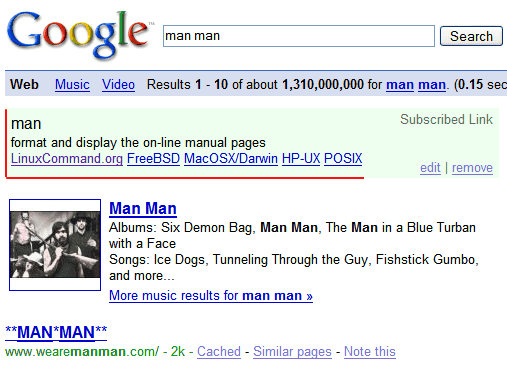 If I search for [man man], Google's results aren't extremely useful, but the new box that shows at the top matches my query with a pattern and displays a short description of the man command, followed by links to the entire entry. The directory doesn't include too many add-ons (around 50), but the public launch of the service will increase its exposure and more websites will build their own add-ons. After all, if they convince you to subscribe to their service, they get a placement at the top of Google's search results for any query that matches their patterns. If you don't like the results provided by an add-on or if it shows-up too often, you can always remove it. It's a great way to expose specialized content to those who are interested, a brilliant way of combining bookmarks with search results. Once again, Google shows it wants to become the central point for all your search-related activities and this service allows it to outsource specialized results to third-party developers. Update: The new section from Google's preferences page has vanished, so maybe the feature wasn't ready for prime time. I agree it's a great idea. But I've tried to use this service in the past and for some reason, it never saves my choices. So, I'll choose the subscribed links I want and add them, and then find they never got added! i want to participate adds for google need some google adds.